The Dentaljuce paeds and ortho module contain loads of spotter questions - conditions both rare and common, with model answers to questions about diagnosis and management. 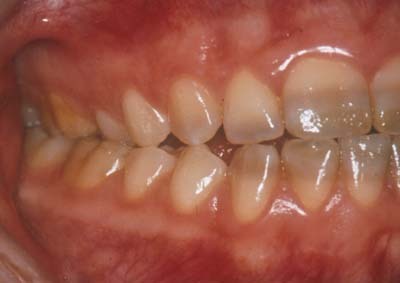 We also have a series of quizzes on the orthodontic diagnosis and management of the common malocclusions. The Paediatric Dentistry and Orthodontics online learning module has clear and concise aims, objectives and anticipated outcomes, listed below. These will appear on the Dentaljuce Enhanced CPD Certificate, along with the time spent, dates, and detailed topics you studied within the module. Certificates can be printed at any time, covering any range of dates. Dentaljuce CPD complies with the UK GDC's requirements for enhanced verifiable continuing professional development. To improve my knowledge of soft and hard tissue oral lesions in children Take the Dentaljuce Paediatric Dentistry and Orthodontics module. • Know how to diagnose and manage a wide variety of hard and soft tissue lesions. To improve my orthodontic diagnosis skills Take the Dentaljuce Paediatric Dentistry module, Orthodontics section. • Learn the basics of orthodontic diagnosis and management for Class I, II d1, II d2, and III malocclusions. To improve my knowledge of soft and hard tissue oral lesions in children. To improve my orthodontic diagnosis skills. Take the Dentaljuce Paediatric Dentistry and Orthodontics module. • Know how to diagnose and manage a wide variety of hard and soft tissue lesions. • Learn the basics of orthodontic diagnosis and management for Class I, II d1, II d2, and III malocclusions. The aim of the learning and teaching materials in this Dentaljuce module is to allow learners to develop their professional knowledge, understanding and competence in paediatric dentistry, in line with their identified personal learning requirements. To introduce the learner to a wide range of paediatric oral conditions. • know how to diagnose and manage a wide variety of hard and soft tissue lesions,through a series of interactive "spotters". • provide an improved level of service to their patients.